Wireless transmission distance is mainly determined by the sensitivity of the receiver and the power of the transmitter. It can be improved by directly increasing the transmitting power or receiving sensitivity. However, these two characteristics are determined by the manufacturer and cannot be changed arbitrarily by the user. In particular, increasing a transmitters’ power is not only limited by telecom regulations, but multi-channel signal interference can be a more serious consequence of doing so. Furthermore, the power consumption will increase, considerably reducing the battery life. The other option is to increase the sensitivity of the receiver. In theory, increasing the sensitivity by 6dB will give twice the receiving distance, but in fact, it is not easy for a user to change the sensitivity. In actual practice, the signal is received via the receiver’s antenna, so the best way to improve the transmission efficiency of the overall system is through improving the characteristics of antennas and the antenna installations. In a wireless microphone system, the signal is transmitted via the transmitting antenna of the transmitter, and is received via the receiving antenna of the receiver. Therefore, the antenna is the passageway for transmitting and receiving the wireless signals, and its functionality directly affects the signal transmission range and stability. The detachable antenna design of MIPRO receivers allows users to choose different types of antennas to install for optimal reception. To choose the correct antenna to be installed on a wireless microphone receiver, we must first identify its frequency range. The antenna usually has the frequency range code on it. To select an antenna, we should make sure the frequency range is within the frequency range of the receiver, so that the signals received by the antenna can be delivered effectively to the receiver. Frequency is inversely proportional to the length of the antenna, thus the antenna of a VHF system is significantly longer than those of a UHF system.In general, the antenna impedance has two categories: 50Ω and 75Ω. MIPRO receiver antenna input impedance is designed with 50Ω, so you must select an antenna with 50Ω impedance to match perfectly to the receiver. Its specification is generally labeled with an input reflection coefficient or Voltage Standing Wave Ratio (VSWR). A good antenna generally has the input reflection coefficient less than -10dB or VSWR less than 2:1.In general, the antenna impedance has two categories: 50Ω and 75Ω. 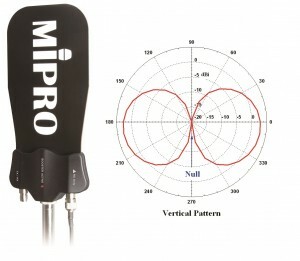 MIPRO receiver antenna input impedance is designed with 50Ω, so you must select an antenna with 50Ω impedance to match perfectly to the receiver. Its specification is generally labeled with an input reflection coefficient or Voltage Standing Wave Ratio (VSWR). A good antenna generally has the input reflection coefficient less than -10dB or VSWR less than 2:1. In general, the antenna impedance has two categories: 50Ω and 75Ω. MIPRO receiver antenna input impedance is designed with 50Ω, so you must select an antenna with 50Ω impedance to match perfectly to the receiver. Its specification is generally labeled with an input reflection coefficient or Voltage Standing Wave Ratio (VSWR). A good antenna generally has the input reflection coefficient less than -10dB or VSWR less than 2:1. Antenna gain indicates the signal transmitting or receiving ability. The gain value is relative to an isotropic radiator, shown in dBi units, in which “I” represents the isotropic radiator, a virtual sphere in which the signals can transmit or receive towards all directions. 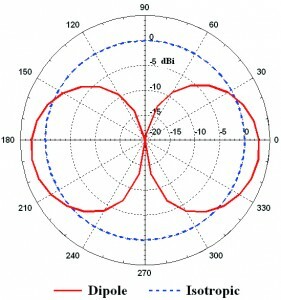 As shown in Figure 1, the theoretical maximum gain value of a dipole antenna is about 2.15dBi. As the gain is usually designed to be concentrated to some degree, a value > 0dBi is obtained. If the gain is designed to be concentrated toward one direction only, the antenna is called a “Directional Antenna.” The narrower the angle is, the higher the gain value; meanwhile, the gain of other directions will decline. Therefore, when users are installing antennas, close attention should be paid to the signal directionality. In actual use, the antenna polarization is an easily neglected character. Depending on the ratio of the electric field distribution, polarization can be divided into “linear polarization” and “circular polarization.” Linear polarization can be divided into horizontal or vertical polarization, according to different placements, while circular polarization can be divided into clockwise or counter-clockwise circular polarization, depending on the rotation direction of the electric field. Most of the antennas are of the linear polarization type, such as a single-pole antenna, coaxial antenna, AT-70, AT-70W and AT-90W. 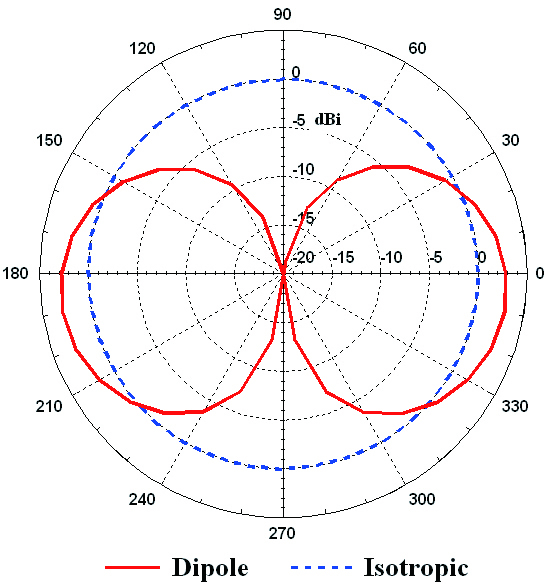 Circularly polarized antennas, in fact, are more like “Elliptical polarization” in their characteristics. The MIPRO AT-100 is representative of this kind. The polarized relationship between the receiving and transmitting antennas will directly affect the quality of the signal. As shown in Figure 2 and Figure 3, if the wireless microphone receiver antenna is fixed to vertical polarization, and users swing the transmitter to the horizontal position, the signal will decline greatly and may result in unstable reception quality. Especially in far and wide environments, the decline will be larger and may cause a brief signal drop-out. In this case, if the circularly polarized antenna is used, the vertical or horizontal polarization signals can maintain stable reception, so the signal will not significantly decline when the transmitter’s position is changed. In a listing of the complete specifications of an antenna, the antenna radiation pattern is indispensable. It helps users to recognize the antenna gain at the Null as well as the angle & direction of the Main Beam. As shown in Figure 4 and 5, antenna pattern diagrams include vertical pattern and horizontal patterns, providing important reference for antenna installation. From the radiation pattern diagrams, we can perceive the difference between the omni-directional and directional antennas. 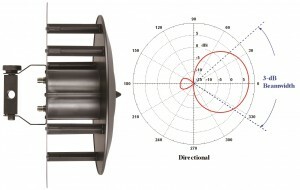 The omni-directional antenna has 360 degrees of reception angle and doesn’t require adjusting the angle of the antenna, as shown in Figure 6. 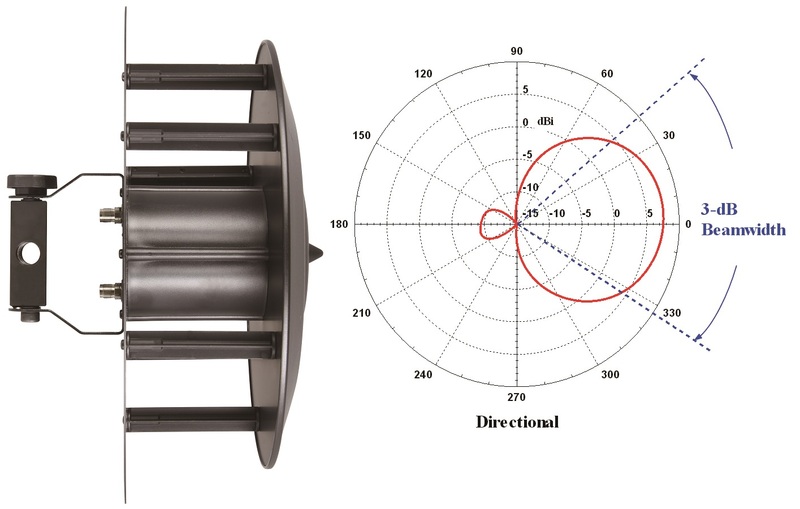 The directional antenna with 3dB beamwidth provides a more focused reception where the range of antenna gain is dependent on the angles and the directionality, attenuating from the maximum to 3dB, as shown in Figure 7. Users can select the proper antenna according to the environment. For example, when there’s no particular direction between the microphone and the receiver, and in short distance, MIPRO omni-directional antenna is recommended. 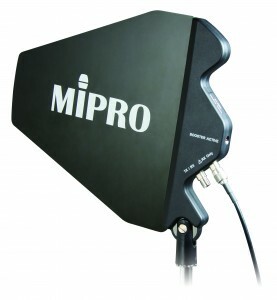 For live stages which need long-distance reception in a particular direction, a MIPRO directional antenna is usually selected to get better signal quality and prevent interfering signals from other directions. Select different types of MIPRO receiving antennas to get the optimal reception quality. MIPRO antenna systems have the most complete product line, providing multi-channel wireless microphone systems with better long-distance transmission and improved signal quality as well as simplifying antenna installation. 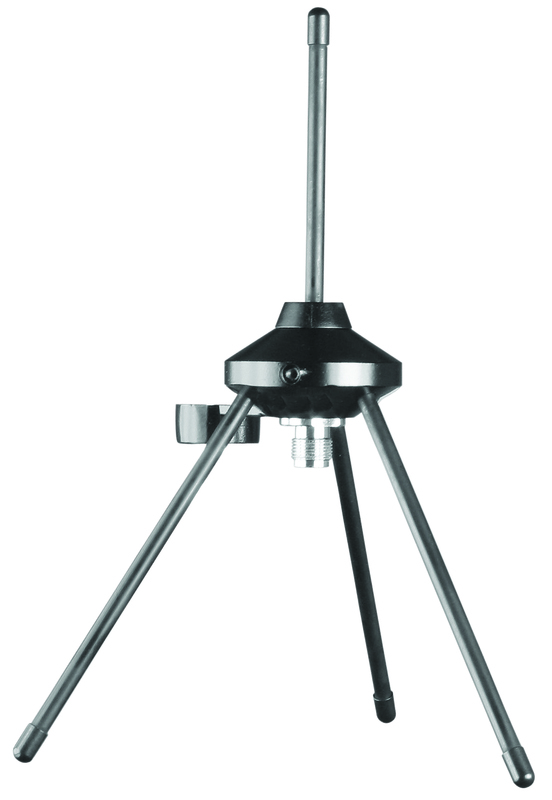 The AT-10 is a 1/4 wave single rod antenna featuring a wider band, omni-directionality and 50Ω impedance. Directly mounts on the antenna connectors of a receiver to become a monopole antenna for adequate sensitivity and operating range. The AT-20 is a 1/2 wave coaxial antenna that functions like a dipole antenna, featuring 2.15 dBi gain, 50Ω impedance, and omni-directional reception. Directly mounts on the antenna connectors of a receiver for adequate sensitivity and operating range. The AT-70 is an UHF antenna that stabilizes signal reception and prevents impedance interference from nearby objects because of its vertical 1/4 wave antenna surround by horizontal antennas at a 45° degree, causing a 1/2 wave dipole antenna effect. Thus AT-70 has higher positive gain than a 1/4 wave single rod antenna and smoother impedance within the 620~960 MHz band. Therefore, the length of the antenna does not need to be adjusted while receiving. The antenna is able to reduce interference by filtering signals outside the range. It is suggested for installation at the central location of a hall, on the wall, inverted on a ceiling, or mounted on a tripod (MS-30). 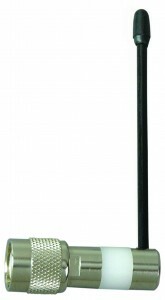 The AT-70W is a bi-functional omni-directional antenna for professional receiving and transmitting within the UHF range. Optimized for 470~1000 MHz, which is fully compatible with US and EU new telecom regulations, it has a 2~4 dBi gain which is ideal for any specific installation requiring full signal directionality. It can be easily distinguished by its new “W-Shape” appearance. The AT-70W has 2 input connectors, “TX” and “RX”, which can be connected to transmitters and receivers directly. The “RX” connector is built with a 12 dB high gain booster, specifically enabling receivers for long distance reception. 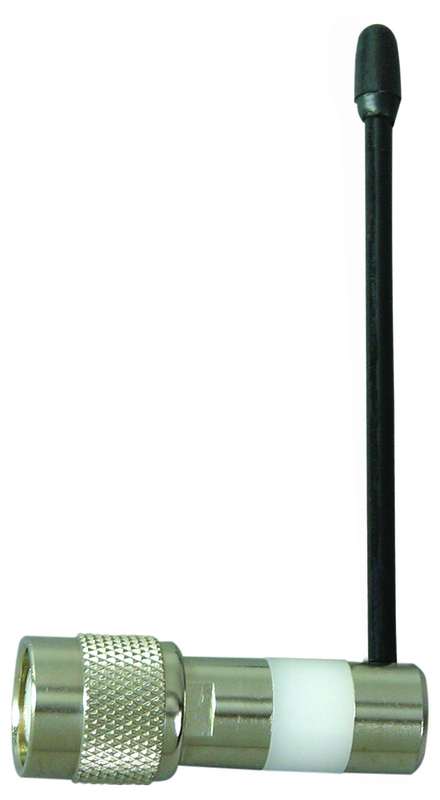 The AT-90W is a bi-functional log antenna for professional receiving and transmitting within the UHF range. Optimized for 470~1000 MHz, which is fully compatible with US and EU new telecom regulations, it has a 4~6 dBi gain which is ideal for any installation requiring specific directionality. It can be easily distinguished from the AT-90 by its new “W-Shape” appearance. The AT-90W has 2 input connectors, “TX” and “RX”, which can be connected to transmitters and receivers directly. The “RX” connector has a built-in 12 dB high gain booster, specifically enabling receivers for long distance reception. The AT-100 has two built-in connectors, one “TX/RX” signal connector for either transmitter or receiver and another “RX Only” (receiver only) connector (cannot connect to transmitter) which has a built-in 12 dB antenna gain booster, providing extended reception range and compensating for coaxial cable signal loss to improve reception range and signal quality. For karaoke, small conference rooms, small concerts or other small-scaled environments, just mount a pair of single pole antenna or standard coaxial antenna directly on the antenna input connector of the receiver and then screw-lock tightly. Even for short distances, the receiver still must keep a stable reception free from interference. When using a single-pole antenna, due to the metal chassis being a part of the ground element of the antenna, you should keep the antenna vertical to the receiver chassis. The receiving antenna should be far away from metal obstructions and noise interference sources in order to get optimal reception. In live stage or other long-distance reception venues, a professional true diversity receiver is required. In addition, installation of the proper antenna system is more important. Mounting an AT-70 or AT-70W omni-directional antenna on a stand or upside down on the ceiling, then connecting it directly to the antenna input port of the receiver with a coaxial cable will increase the receiver’s reception range and quality. However, since the antenna is installed at a great distance from the receiver, connecting with a long coaxial cable will cause some signal loss. The user should choose a cable with lower loss based on the distance, or else add an AT-70B or MPB-20 antenna booster to compensate for the cable signal loss. For long-distance reception in a high signal interference environment, the better choice is to use an AT-90W wideband log antenna. Set it on the stand vertically and adjust the polarity direction toward the wireless microphones’ operating position. Since the log antenna has directivity and higher gain, it gets better reception quality. Alternatively, in the same high-interference operating environment, the best option is to use the AT-100 wideband circularly polarized antenna to eliminate possible signal dropouts and insure more stable reception quality. (Refer to the AT-100 catalogue). When two receivers need an external antenna to increase reception distance, you can use the AD-12 Passive Antenna Divider/Combiner to simplify the installation. When three or more receivers need an external antenna to increase reception distance, you can use the AD-707a UHF 4-channel antenna divider to simplify and improve reception quality. For five or more receiving systems, you can use two or more AD-707a. In some large-scale professional stages requiring long-distance receiving operation, where the antenna system requires long cable connections, you must install an AT-70B or MPB-20 booster, or an AT-90W or AT-100 directional antenna with built-in booster, to compensate for the cable loss in order to get optimal reception. In professional live stage, auditorium and similar long-distance reception venue applications requiring up to 16 channels to be operated simultaneously, use 4 sets of ACT-74 quad-channel true diversity receivers and one AD-707 wideband antenna divider, connecting with a pair of AT-100 UHF circularly polarized wideband directional antennas. This package is the most economical combination, providing optimal performance with easy operation and requiring minimal installation space.